Brands and marketers have been trying for years to crack the secret to Twitter success. What does it take to get a tweet noticed in such a fast-moving stream of messages? How do you get noticed in a world of information overload? Wonder no more!!! I’ve found the secret to uber-enormous Twitter engagement!! Do you see those numbers at the bottom?? 77 retweets!! 712 likes!!! GTFO, right!!??!! 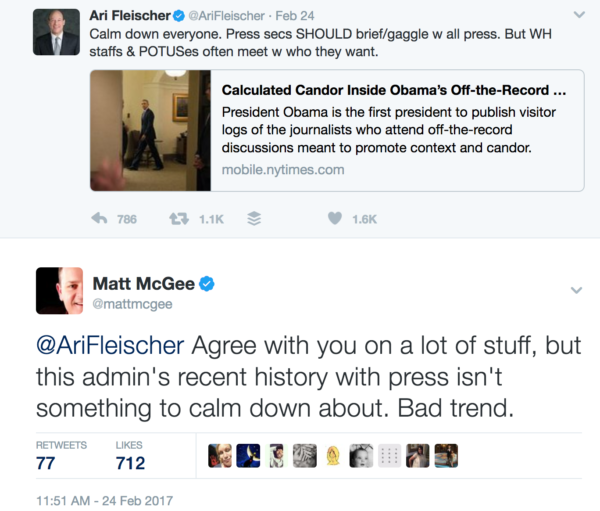 I follow Ari Fleischer, the former press secretary for President George W. Bush, on Twitter. He’s an interesting person to follow. Sometimes too conservative for me, and too quick to defend Republican politicians — like Trump in the tweet above — but usually pretty informative and a good balance to some of the overly liberal tweets in my stream. All you need to do is find a tweet from a popular or semi-popular account, reply to it, and cross your fingers that Twitter shows it as the first reply under his tweet. In all seriousness, this is the second time Twitter has shown one of my tweets as the first reply under a popular user’s tweet, and both times my tweet has seen amazing engagement. (The first one didn’t come close to 700+ likes, that’s for sure. That’ll go down as my most popular tweet ever, no doubt in my mind.) I have no idea what the algorithm looks at when it decides to put a tweet first among all the replies — mine wasn’t the first reply; I tweeted that 10 minutes after Fleischer’s tweet. And by the way, in case it’s not obvious, all of the above about “the secret to Twitter engagement” is humor/sarcasm.